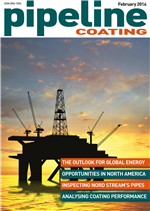 The February 2014 edition of Pipeline Coating is now available for viewing. Just click here to see the magazine in full, completely free of charge. Global industry news including the latest on Keystone XL, Technip winning the Jalilah B project, the first VintriPlant installations, and Statoil cutting planned Kristin link. The latest coating materials and equipment including LaBarge's Ruckus wireless set-up, Axalta's new high temperature epoxy, and updated mixing options from Sulzer.